Big community building event at the girls’ school tonight. Cover me, Dan O, we’re going in. dear NT mom selling pizza at the school event tonight, i can’t possibly tell you how much your words meant to me. and i’m so sorry that i didn’t stick around to really tell you that, but you see, i had to follow my girl because in a place like that if she can’t see me, it gets .. well, yeah. but please know this – when you said to me, ‘what a difference a year makes’ while smiling warmly at my girl and then we shared that moment of remembering that yeah, last year she was sort of (ok, completely) a disaster at this thing and *this* year, she was managing – like really, really managing – the chaos and well, THEN when you smiled at me and said, ‘i just LOVE her. she’s just so awesome,’ well, you damn near did me in, lady. and as much as i turned away because i needed to follow brooke, i also turned away because if i didn’t, i was going to be blubbering all over her pizza. so, i guess what i’m trying to say is — THANK YOU. The moment we walked into the school, I knew. Not only was this going to be hard, it was going to be damn near impossible. They had moved some of the tables into the entryway. The US, Canada, Brazil – all squeezed into the tight space of the front hall. Brooke blew right by them. She was on a mission. We’d prepped her before we’d left the house. Last year we’d gotten three out of some thirty some-odd stamps, but she remembered. Of course she remembered. It wasn’t until we got to the check-in desk that we discovered that the passports and stamps had gone the way of the wagon wheel – replaced this year by maps. And pencils. And a very confusing system in which we were to mark down the countries we’d visited according to a legend that provided a number that we were then supposed to .. OK, yeah, we politely declined the map. “We will go to the gym!” Brooke announced. I told Luau and Katie that I’d follow her and they should go on their way. The gym was full. Really full. Hanging out in the middle of a rugby scrum full. But Brooke walked in. We walked the perimeter of the gym, checking out the tables from each country. Well, sort of. I was just along for the ride, but I’m fairly certain that we were looking for only the following: Japan (they’d had sushi last year), China (they’d had toys last year) Israel (they’d had oranges last year) and India. That last one I can’t explain except that she made it quite clear that we were looking for it. Once we found it, she shrugged and walked away. In China, she grabbed for a dumpling before I could stop her. I’d already downed a piece of Bavarian poundcake, a square of Dutch cheese and a Greek cookie because she’d decided to ‘taste’ them at the various tables – meaning that she’d picked them up, put the teeniest, tiniest possible part of her tongue on the teeniest, tiniest corner of the item and then put it right back down again. I was on patrol, but in China I wasn’t quick enough. When the nice lady responded with, “You’re welcome,” my girl muttered, “Bu Keqi,” cause – duh – that’s how you say, “you’re welcome” in Chinese. I would therefore like to take this time to offer my heart-felt thanks to both Kai Lan and Dora. After about four tables, Brooke had had enough. I suggested some pizza and we headed out into the hallway, where we encountered the lady in the quote at the top of the page. I’m telling you, folks, she almost did me in. We ate our pizza in the same quiet hallway as last year. But this year we were there because it seemed like the best place to eat our pizza, not because we were holding onto the last piece of driftwood we could find in the sea, making one last-ditch effort not to drown – kinda like last year. After dropping the pizza face-down on the floor finishing up, Brooke took us back into the gym, where everyone, it seemed, had a red, white and blue pinwheel from the US. She decided that she needed to have one too. We walked back out to the front hallway. It was crazy. A show was letting out of the auditorium and people were everywhere. They squeezed by, laughing and squealing and calling out for each other. Brooke’s entire body was tense. I waited for the inevitable scream. It didn’t come. Brooke reached up and pressed her hands into my back and belly, squeezing as hard as she could. It’s what she does when she’s overwhelmed. She pulled my face down and gave me a kiss. Not the affectionate kind, the panicked, eyes-wide kind where she mushes her face into mine. They hurt, but they help. I assured her that I’d hold onto her. I squeezed her shoulders from behind, hoping the pressure might help. She turned around and pointed in the opposite direction. “We would go to the library,” she said. I asked her if she wanted me to try to get a pinwheel before we bailed. We lasted about ten more minutes. The library was closed, so we took a little walk around. Kids were running and yelling everywhere. Two boys who couldn’t have been older than six rolled around in the middle of the floor together, wrestling. Three more boys ran by at top speed, just missing them. The poor custodian looked like he was going to tear his hair out. “Where are their parents?” I wondered aloud. He looked at me like I had three heads. Yup, got it. No tears. No screaming. Just words. I declared victory as we walked out into the night. I told her I thought she’d done great. We walked around the corner and up the hill to the car. I know the line. It’s from Bob and Maria, the series of stories that her speech therapists used to use for social prags until we discovered that she was mimicking the How Not To Be a Friend examples from the books. Oops. There was no question that the line was a script. Even if I hadn’t recognized it as such (and this wasn’t one I was going to miss given the frequency with which she says it), her prosody gave it away. And scripts – or at least the words in them – can be easy to dismiss because, well, they’re scripts after all. But something gave me pause. We stopped walking and I grabbed my girl’s shoulders. She knows the word. We use it a lot these days. And that was how we spent the ride home, with a whole lot of how how hows and even more so so sos. My kid rocks. Other people see it too. Dora and Kai Lan are educational. Dutch cheese, Greek cookies and Bavarian poundcake are not a great combination. People who leave their five and six year-olds to fend for themselves at huge events are likely to find them rolling around on the floor. Custodians are underpaid. Scripts are not always what they seem. My kid rocks. Ed note: My new best friend and blog Mom crush, Sunday Stilwell from Extreme Parenthood asked me to participate in her meme this week. And since she’s my new best friend, I totally couldn’t say no. So even though I’m not nearly as cool as she is, I promised to try my hand at creating a “Hey, girl” poster. And what are all you people doing here? Can’t you see that George and I are having a moment? She started this hilarious meme, riffing off the “Hey, girl ..” posters that were flying around the Interwebz and in so doing, she invited us all to join in the fun by creating our own. So, mix the above with the below and what you’ve got is this gal’s fantasy a loving, devoted wife agreeing to play along with her new best friend’s awesome idea. Woot Woot for the Pizza Lady! As for George/Ryan…I wouldn’t kick either out of the bed for eating crackers! Yes, that was definitely 28 minutes of around-the-world-victories! I can only imagine how that cacophony can be overwhelming. She handled it with aplomb!! And I loved your hey girl thing. Nicely done (I don’t get Gosling either). I am left completely speechless by what a difference a year makes. I am so incredibly proud of Brooke!!! I have often said that every time I see Brooke or hear of another accomplishment that she is growing and has grown by leaps & bounds! This is amazing! I am so proud of her. I LOVE that you joined in on the Special Needs Ryan Gosling fun and because I love you too I made you a special “Hey Girl” poster and sent it to you via Twitter and also put it on my FB wall. Also, your daughter is a rockstar! Here is a link to the special “Hey Girl” I made for you! 28 minutes that will live on in your memory of victories for a life time!! Way to go Brooke!! Awesome job!! oh, and pizza lady – my boy’s school could use someone like you – possibly a clone?? Just asking!! Self advocacy – check! just awesome and btw George is the way to go! 28 minutes in that chaos is amazing!! And she TOLD you how she FELT. Love! 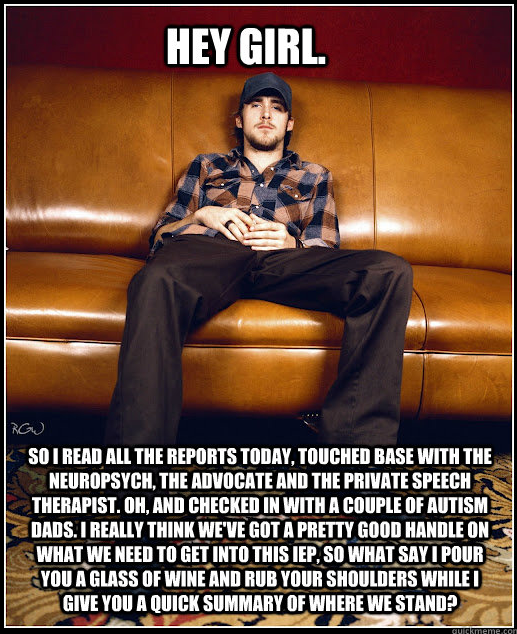 I like your “hey, girl” poster, too. This made me so HAPPY!!! omg how amazing and awesome!! Kudos to Brooke. THAT right there, is a quantum leap. Just. Huge. Swoon! I love your poster! And I’m with you. 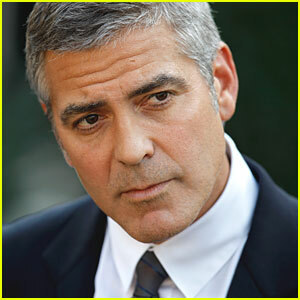 I’d prefer George Clooney as well. Your recap of the school carnival thingy made me cry. I just met with my son’s teachers last night and they mentioned how terribly stressed he seems at school this year. Reading what your daughter said just made me realize (yet again) the kind of pressure these kids are under. Even when they do FANTASTIC, they feel like failures. And this just breaks my heart. Brooke is amazing. Just amazing. But not a surprise, seeing the family support she has. If he’s rubbing your shoulders, I’d request a LONG summary if I were you. Brooke is a Rockstar Princess! And I’m with you George is my pinup guy too!! Love this meme. Want this in real life. Hey. . . ever think about taking a post off from tearing me up? Huh? Because *I* think about it. Like what about a day where you post ONE BLOG POST that doesn’t even make me tear up a tiny bit. THAT would be a win. That would be SO SO SO nice. What an amazing night. You should be proud of her! So awesome. First they changed what you had planned for and she went with it, then those words… Isn’t it awesome. Like the darkness is lifted and everything is understood. All your hard work and efforts and she uses her words to express herself. Really doesn’t matter what she says or how she feels but knowing makes such a huge difference. One positive experience like that and I hope it means many more for her! Good job mom! **Correction: A year earlier he would’ve just had a meltdown. I hit post before I could fix it. 😉 So YES, what a difference a year makes!! I’m so happy for Brooke and you. What a great ending to a successful yet challenging evening. My daughter does the same kisses with me. Mashes my face with hers. Ouch is right but I’ll take the pain if it soothes hers in any way. Sounds like you’ve got an awesome daughter. Ryan in any picture just lightens the mood a bit. Great post! This post makes me super happy, for lots of reasons. Functional scripting (we do that at our place – our favorite right now is, “HELP! I’M STUCK!” from Thomas the Train, howled at the hematologist yesterday…), words to express, 28 minutes. So many times, we treat time as our enemy, as if we’re fighting some damned bomb comprised of seconds and minutes. And maybe we are. But maybe – just maybe – time is also a gift. I went to the same event at a different school the next day, and I barely lasted long enough to visit all of my students at their tables. It was insanely crowded, hot, and loud. Just your description gave me a mini panic attack thinking about bringing Cullen to a similar school event. Yet when I think about a year or two years ago,I can also say “What a difference ____makes”. So thanks to you (again),I will choose to focus on that rather than the aggressive behavior that has popped up this past month. just made my heart soar to read about your daughter’s success. i feel the same way anytime my son has the same kind day. have to look for the positive and remind them (and ourselves) how far they’ve come. Brooke being able to use words to tell you what she needed is amazing! It’s my dream that my daughter will be able to do that one day. You give me serious hope.